The Parent Portal has always been a great way to keep parents up-to-date with a student’s progress. Be it grades, attendance, homework, discipline, or even fees, the Parent Portal allows a parent to periodically check in on a student, to make sure the student is on track. But the Parent Portal can be a conduit for so much more. The Parent Portal can be used to keep parents engaged, not only to matters pertaining to the student, but also to the school in general. This is done by improving the way the school communicates with parents, and allowing them to participate and contribute. You can post updates, pictures and files directly to the Parent Portal via the Parent Discussion Board. 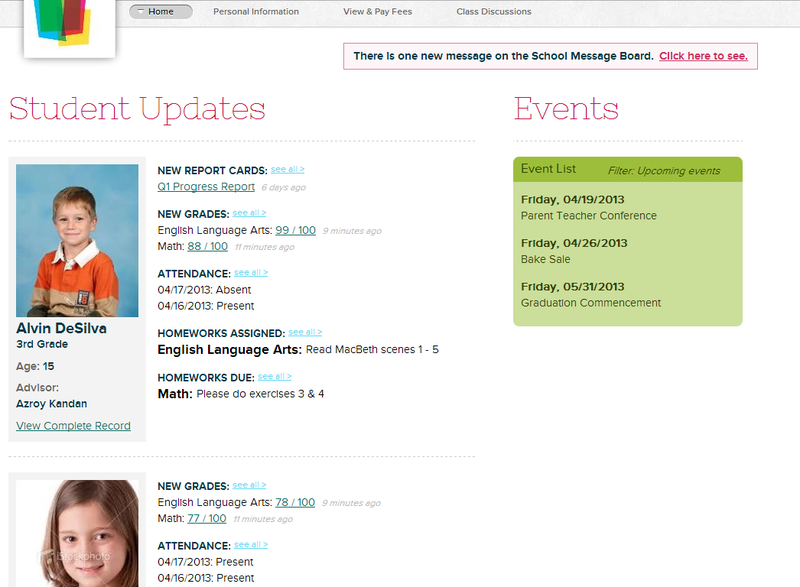 Portal announcements appear right after the parents log in, just below the student’s summary information. When posting pictures, thumbnails are created automatically, so parents can instantly view photos without additional clicks. Portal Announcements are particularly useful for sharing events, like fund-raisers, concerts, bake sales, or annual dinners. You can also upload forms and surveys for parents to fill. 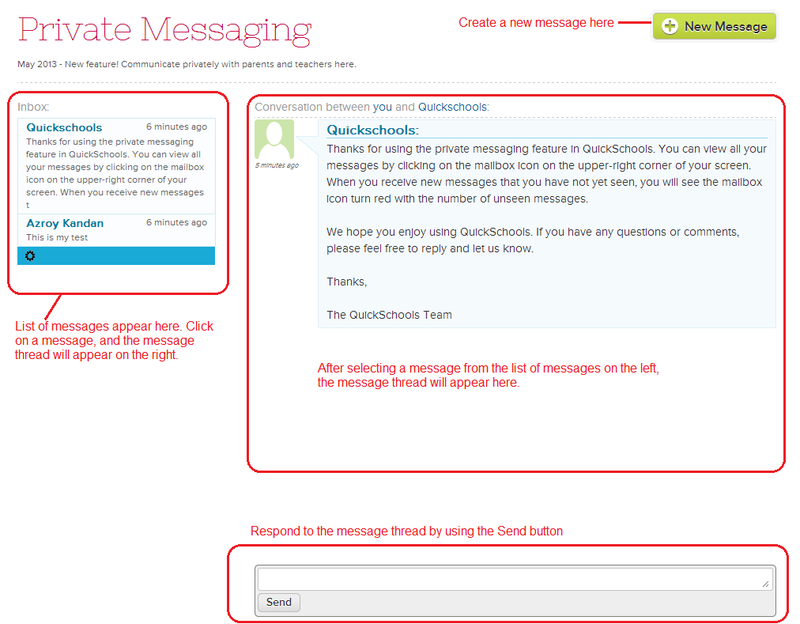 Teachers, students and parents can also share comments, pictures and files on a per subject basis. 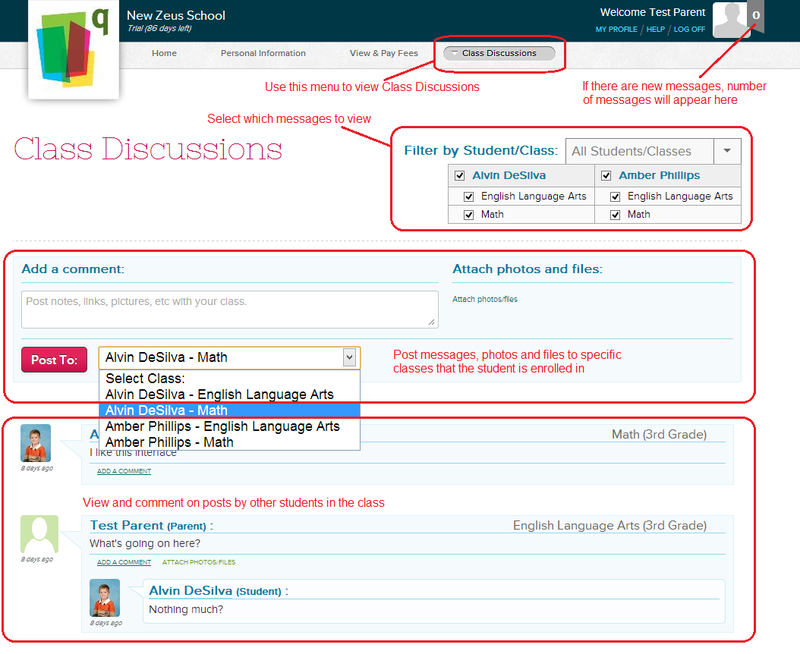 When parents access the Class Discussions, messages from all subjects are displayed by default, but parents can filter messages based on specific students or subjects. This is useful for talking about week-long assignments or projects over the break. Parents can make inquiries about homework, which may be useful to other parents and students. And if parents prefer to communicate privately with teachers, there’s always the option of using our new Private Messaging. When a private message is sent, the recipient also receives an email notification (unless the user chooses to opt out of these alerts). Private Messaging is useful for communicate more sensitive issues, like grades and performance. If parents can be encouraged to log online frequently, and to participate in discussions via the various tools available, you can be sure to build a strong community feeling. The social experience within QuickSchools can be a powerful one, as is evident in many of our schools. Just give it try by turning on the related modules. For parents who rarely log in, or who do not like/want to log onto a Parent Portal, there is always the option of emails (some modules allow email notifications to parents), or even text/voice messages (via our Mass Messaging feature). Although these mediums are effective in their own way, it’s not quite the same as sharing photos or discussing issues online. The experience is quite different. It’s quite a big change in philosophy, which we hope schools and parents will embrace. If you have any further suggestions to help improve the social experience for parents, teachers and students, please share it with us. We’re always looking for ways to improve.